UPDATE: Let’s Have a Party! Since several of these people are no longer living and the party will therefore have to be a ‘ghost party,’ I’m thinking it’s appropriate to have this party on Halloween rather than waiting for June. So, so pick a graveyard nearby and – Let’s Party! 1) Elizabeth Harmon June 22, 1824 – Elizabeth was the wife of my 1st cousin three times removed. 3) Thelma Elizabeth Brown June 22, 1912 – Thelma was the aunt of my ex-husband. Thelma died the month I was born and her only child, Bill, currently lives across the street from me. Although living people don’t show up in my daughter’s online database, I know my son-in-law, Keith, and I share our June 22 birthday. I use the free version of a database and it is restricted in several functions, including the calendar function. My daughter has uploaded her database to a website that has a feature called Dates and Anniversaries. It’s set up so that everyday when you click on the feature it lists everyone with that birth date, anniversary date, burial date, or any other event associated with that day. In addition to this automatic feature, you can select a specific month and day to choose what you want to see, which I did this evening. 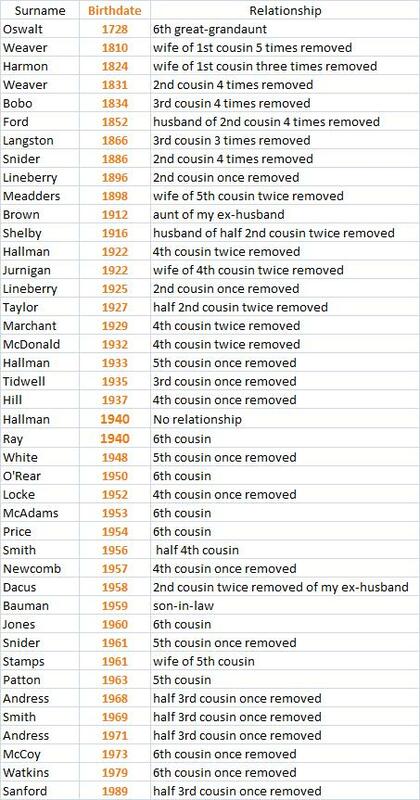 Once I had the names from Kay’s website, I then used another database with a functional relationship calculator so I could quickly determine the relationship between those me and those ancestors who shared my birthday. The website Kay used to create her website is TNG. Her website is K Bauman Tree House and can be accessed here. I’ve used the Dates and Anniversaries feature almost dailyever since she set up the site and love using it.